A hill is being illegally cut down along the Gaggal-Dharamsala state highway, 7 km from the district headquarters, right under the nose of the district administration. The government has drawn up a plan to set up solar power plants in major office complexes and police stations and install solar lights. The government has decided to formulate a Solar Energy Policy to facilitate speedy harnessing of the solar power potential and help the state meet the mandatory renewable power purchase obligation. Chief Minister Virbhadra Singh today said the construction on all four parking projects here should be speeded up and proposals for creating more parking places should be prepared. The state government today decided to constitute a team to expedite work on land acquisition on all three projects, including the Bhanupali-Nangal-Bilaspur track, within the next six months. The Himachal Lokhit Party (HLP) has lambasted the Congress government for its failure to carry out expeditious probe into the scams of the BJP regime and demanded that the phone-tapping case be handed over to the CBI. Stress, change in lifestyle, smoking, consumption of liquor, unbalanced diet and some other unknown reasons seem to be the major reasons for nerve-related hearing disability, which is more prevalent in this hill state in comparison to major cities of the country. These factors contributing for such deafness need to be addressed and reasons need to evaluated. The nation can never pay back the debt of freedom fighters who fought against the British and ensured that India was free. This was stated by ID Bhandari, state Director-General, Home Guards and Fire Services, while addressing a memorial function as a chief guest. The event was organised by the District Freedom Fighters Association at Rahiyan Shaheed Smarak, 25 km from here, yesterday. Arun Dhumal, son of BJP leader PK Dhumal, today refuted allegations of any wrongdoing in the land purchase made in Dharamsala, in which an FIR had been registered against him and his MP brother Anurag Thakur. Rajesh Dharmani, Chief Parliamentary Secretary (CPS), who resigned earlier and later withdrew it, has expressed anguish over the news items published in local dailies regarding his resignation and its reasons. The 13-member governing body of the North Zone Cultural Centre (NZCC) in Patiala held its 27th annual meeting under the chairmanship of Governor, Punjab, Shivraj Patil here today. The management of Government College here today constituted a 10-member committee to look into the facts that led to the controversy between students and teachers of the college following teasing of some girl students. Members of the Regional Tibetan Youth Congress (RTYC) organised a “Run for Tibet” programme to mark their 44th founding anniversary at McLeodganj today. A woman and her friend were arrested for allegedly dragging her 17-year-old daughter into the flesh trade here yesterday. A motorcyclist was injured seriously and his pillion rider killed on the spot, when their bike tipped over the road near Sariyaanu in the district last evening, said a police report received here today. A hill is being illegally cut down along the Gaggal-Dharamsala state highway, 7 km from the district headquarters, right under the nose of the district administration. The loose soil and rocks along the highway are posing a threat to commuters and a nearby rivulet where these are being dumped. Though the PWD authorities in Dharamsala had lodged an FIR against the damage to public property (state highway) due to the illegal cutting down of the hill, no action has been taken to stop it. PWD Executive Engineer Vijay Chaudhary at Dharamsala said he had issued a notice to people using JCBs to cut the hill. When they did not respond to the notice, the authorities filed an FIR against them. 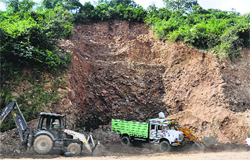 "The illegal activity has caused a damage of Rs 4 lakh to the state highway. We will recover the amount from the accused," the Executive Engineer said. The illegal activity was largely taking place at night. The soil and boulders were falling on the state highway and obstructing traffic. The accused were also dumping loose soil downhill along the road into the rivulet passing through the area. A few policemen had reportedly visited the spot after an FIR was registered against the accused, but the illegal cutting down of the hill continues unabated. A PWD official said they traced the owner of the land to Palampur. After the notice was sent to him, the owner challenged the authorities that it was his land and he could do anything in the area. However, even if it is private land, one has to take permission from the PWD and forest authorities before raising any structure or carrying out any construction activity along the road. Moreover, dumping into natural rivulets is banned. The PWD authorities said the cutting down of a portion of the hill could also damage the adjoining hills and pose a threat to commuters on the road due to loose rocks falling from the hill. Giving this information here today, Power Minister Sujan Singh Pathania said Himurja would set up 4-kw solar power plants at all the district Secretariats and 2-kw plants at all 219 police stations. He said a 6-kw solar plant had already been set up at the state Secretariat here. Besides, a 10-kw solar plant had been established at the Ransar island in the Pong reservoir and 2-kw plant and 200-kw plant at Baru Sahib. Pathania was speaking after inaugurating the two-day Green Energy Fair organised as a part of World Wildlife Week by the WWF-India in association with Himurja and the local Municipal Corporation. He said the solar city plan for Shimla had already been approved and 1,000 solar streetlights would be soon installed in the city. The solar plan for Hamirpur had also been formulated and likely to be approved shortly. Chief Executive Officer of the Himurja Bhanu Pratap Singh said the Centre had sanctioned 10,000 solar lanterns for Kinnaur district which would go a long way, ensuring uninterrupted power in the far-flung areas. Manufacturers of renewable energy equipment had set up stalls at the Green Energy Fair to showcase solar panels, solar water heaters, solar lighting systems, cookers and refrigerators and even compact biogas plants for household use. The state has so far not made any headway in the solar power sector and as a result the electricity board has not been able to meet its solar-specific obligation. As per the regulations, it was mandatory for the state utility to purchase 10.1 per cent power from renewable sources from 2010-11, which was to increase to 11.1 per cent in the following year and 12.1 per cent in the third year and so on. During the current year, 10 million units of solar power is to be procured for which a minimum installed capacity of 11 MW is required. The state will still be far behind as the Central Electricity Regulatory Commission (CERC) has mandated a minimum 0.25 per cent solar energy from the current year which should go up to 3 per cent by 2022. The mandatory solar power to be procured will be about 450 million units for which 240 MW of installed capacity will have to be created. The state has already commissioned 59 small hydropower projects (up to 5 MW) with the aggregate capacity of 225.25 MW. However, it has failed to make a start in the solar power sector for which there is vast potential in the tribal areas such as Lahaul-Spiti and Kinnaur. Presiding over a review meeting of "Parkings and Comprehensive Mobility Plan" project here, he said under-construction parking projects at Sanjauli (400 vehicles), Chhota Shimla (250 vehicles), lift (700 vehicles) and Vikas Nagar (175 vehicles) should be completed soon. He said two floors of Sanjauli parking would be completed by January while Chhota Shimla car parking should be completed within a year. He directed officers to fix the time limit for the completion of other two under-construction parkings. The Municipal Corporation had identified 71 sites for parkings of over 5,000 vehicles and these should be constructed under the Public-Private Partnership (PPP) mode. He said the parking facility for 350 vehicles would be constructed at new IGMC hospital. Virbhadra said there were 55,000 registered vehicles in Shimla and 1,769 of them were parked on the streets and 512 on off-street parking space. He said a Comprehensive Mobility Plan (CMP) had been prepared for the town to address traffic growth with action for achieving the objectives for sustainable multi-model transport system for the city. A Personal Rapid Transit system would be introduced in the town to decongest the traffic. He said it would be set up on Circular Road at a cost of Rs 750 crore on Design Built and Operate Transfer bases to avoid the traffic congestion. Virbhadra directed the MC authority to take the services of expert conservation architect Ved Segan for the renovation of town hall building. Senior officials of the state government led by Chief Secretary Sudripta Roy today held a meeting with Anil Swaroop, Additional Secretary, Cabinet Secretariat, Government of India, here today. The three rail line projects, Bhanupali-Nangla-Bilapur, Nangal-Talwara and Chandigarh-Baddi, have been put on the fast track. Himachal assured Swaroop that a team of officials would be constituted so that work on acquisition of land for the extension of the Bhanupali-Nangal-Bilaspur rail line could be completed within the next six to eight months. Proposals are also afoot to extend the railway line from Bilaspur to Leh via Manali as it could provide an alternate link for carrying defence supplies to the border areas in Siachen. Himachal has been seeking extension of rail line to improve connectivity which is dependent on land transport. The cost of the 63-km Bhanupali-Nangal-Bilaspur rail line was estimated to be about Rs 1,046 crore in 2008 which has now escalated to over Rs 3,000 crore. The Northern Railway had released Rs 17.25 crore for the rail line in 2009. Even though it was decided that the cost sharing between the Centre and Himachal would be on the basis of 75:25 but later Himachal was asked to bear the additional cost for land acquisition and cost escalation. During the meeting it was also decided to pay more attention towards the Pathankot-Jogindernagar rail line which has great heritage significance. The Shimla-Kalka rail line has already been accorded heritage status. In the resolutions passed at a meeting of its state executive, the party pointed out that the issues such as the opening of private universities, irregularities in the transfer of land to the State Cricket Association and other scams were not being pursued seriously. The police officers and officials of the telecom companies involved in phone-tapping had not being interrogated. This was stated here today by Dr Sanjay Sachdeva, Director, ENT, Head and Neck Surgery, Max Group of Hospitals, on the culmination of a day-long free ENT camp organised by the local branch of Vivekanand Kendra as its monthly feature. He said deafness was prevalent among 7 to 10 per cent of the population of this hill state, above the age of 50 years. Dr Sachdeva said in major cities of the country the prevalence of this type of hearing disability was commonly seen in people in the age group of 65 to 70 years, whereas it was early 50s in this hill state. This population did not include those who suffered deafness because of ear discharge and other reasons, he added. He suggested that the thought process and studies needed to be conducted to prevent the increase in hearing impairment. During the camp, 73 patients suffering with ENT problems were treated by Dr Sachdeva out whom 35 were suggested super-specialised surgeries which would be carried out by him at surgical camps being organised by the kendra at the Zonal Hospital in Dharamsala on a monthly basis. Today 29 audiometric tests were also conducted in collaboration with the Chinmayanand Organisation for Rural Development during the camp. Bhandari reminded the audience about the historic resistance offered by Praja Mandal freedom fighters against the forces of Raja Anand Chand, the last ruler of the then princely state of Bilaspur, at Rahiyan. He said this peaceful resistance had forced Raja’s forces to retreat. It later convinced the Raja that it was time for him to quit and give freedom to the people of the state. Although India attained its freedom on August 15, 1947, yet the Bilaspur state got freedom at end of this satyagrahis’ resistance on October 12, 1948. Bhandari paid tributes to all freedom fighters of the country and the state. He said stories of the freedom movement should be included in syllabus of schools so that the coming generations could take inspiration from these. Bhandari donated his land adjoining this memorial to the District Freedom Fighters Association for the renovation of the memorial and development of a park around it. Several freedom fighters of the Praja Mandal Movement, including Amar Nath Dogra, Sehaj Ram Sharma, Master Kirpa Ram, Ganga Ram, Budhi Ram, Ranjit Singh Guleria, Shankar Dass Varma and dependants of former freedom fighters, were present on the occasion. "I have been compelled to hold the first press conference of my life as all sorts of allegations are being made about the land purchase made by me and my elder brother, which I would like to clarify," he told mediapersons. He said the news reports appearing in the media were incorrect as they had neither forged any documents nor made seller of the land Premu landless. An FIR has been registered by the Vigilance Bureau against Arun and Anurag. The case pertains to purchase of 32 marlas of land at a cost of Rs 3.60 lakh. The sale deed was registered on January 17, 2008, in the office of Sub-Registrar in Dharamsala. He distributed documentary evidence of the land deal, including the sale deed and an affidavit by the seller Premu that he had not been rendered landless. The affidavit also mentions that the stipulated period of 15 years during which he could not sell the land had also got over. Premu in the affidavit has mentioned that the land was given to him on December 7, 1992. He said the fact that nobody was aware of the complainant or the basis of the FIR clearly raised questions on the intention of the Vigilance Bureau. "I want to ask the Chief Minister whether one single case of land deal between two individuals is being probed or all such land deals are being looked into," he quipped. He also objected to the statement of the SP, Vigilance, that Premu was illiterate. "I fail to understand how and why the Vigilance has stepped into land deal as this is solely the job of a revenue official," he remarked. "It is the Chief Minister who has virtually declared an open war against my family and I accept the challenge," he stated. He said during the next two days, he would make some revelations regarding certain land deals made by other people. Talking to mediapersons here today, Dharmani was critical of a few journalists who never talked to him, yet wrote stories by “putting words into my mouth, probably under the guidance of our able friends”. Dharmani said he had been feeling uncomfortable for several months as he had not been given any responsibility. He said that was why he had now decided that he would forgo all facilities and not accept any salary of the CPS, bungalow and government cars. He said,"I will accept the office in the Secretariat as it is meant for people and I still believe that I might be of some use to people and voters through this office." He denied that he had resigned to put any pressure for any ministerial berth or for getting any better position, nor it was any political drama. “I had a long discussion with the Chief Minister and I decided to withdraw my resignation after he assured me to look into my grievances. I believe in him as he is a senior and respected leader. He stressed that the party expected better relations from leaders like him due to coming election as he is dedicated soldier of the party,” he added. Sources said the council passed a resolution asking the defaulting partner states in the cultural centre to give their share in corpus of the institute. The NZCC at Patiala is a joint initiative of Punjab, Haryana, Himachal Pradesh, Jammu and Kashmir, Rajasthan, Uttarakhand and Chandigarh. Sources said most of the states were defaulting in contributing their financial commitment towards the cultural centre that was established in 1986 in Patiala. Jammu and Kashmir and Himachal Pradesh have not deposited their share, sources said. The governing council maintained that the basic objective of the centre was to maintain cultural unity among the northern states and showcase their culture in the country. It also pressed for implementation of the Aiyer committee report with respect to the cultural centres in the country. The management of Government College here today constituted a 10-member committee to look into the facts that led to the controversy between students and teachers of the college following teasing of some girl students. The committee will submit its report within two days. The students affiliated to the ABVP stayed away from their classes and raised slogans against the management and teachers. They demanded that the history teacher, who allegedly made derogatory comments against girl students, should apologise. The faculty on the other hand also boycotted classes and demanded that the president of the Student Council should be suspended for misbehaving with the teacher. The arguments between students and the history lecturer of the college broke out on Saturday. The students alleged that they had made a complaint to the college management that certain boys were teasing girl students staying in college hostel. However, the history teacher allegedly said the girls were responsible for the boys' action. The students boycotted the classes and raised slogans against the college management. The teachers also boycotted classes, alleging that the council president had misbehaved with them. There was division among the students also as some of them owing affiliation to the National Students Union of India (NSUI) sided with the teachers and accused the ABVP for vitiating the academic milieu of the college. It was for the second day today that teaching remained suspended in the college. The police rushed to the college campus to avert any clash. However, sources in the college management said the matter was likely to be resolved tomorrow as an agreement had been reached between the faculty and agitating students. Around 100 members of the RTYC ran from the Tibetan Institute of Performing Arts (TIPA) at Dharamkot to Forsythganj and back. The participants wore “Save Tibet” banners during the event. The participants said the programme was organised to highlight Tibetans’ plight in Tibet. As many as 144 self-immolations had taken place in Tibet till today. Most of the self-immolators had demanded the return of the Dalai Lama. However, despite such a huge number of self-immolations, the Chinese government had not taken any step to address the sentiments of the people residing in Tibet, the participants added. Reports said the girl, accompanied by village elders, met SP Kapil Sharma and gave a memorandum making serious charges. The girl alleged that a youth tried to sexually assault her twice during the night, but her courage helped her save herself from his evil designs. She alleged that she was shocked that even her mother helped him in attempting this crime and tried to pacify and persuade her to surrender to him. Though the girl reported the matter to the Kharsi police chowki nearby and the police arrived there after some time, it did not intervene and take any action at all, the girl alleged. The girl's parents separated several years ago and she lives with her mother. She alleged that her mother was indulging in several illegal activities. A case has been registered and investigations are on.